The concept is simple. 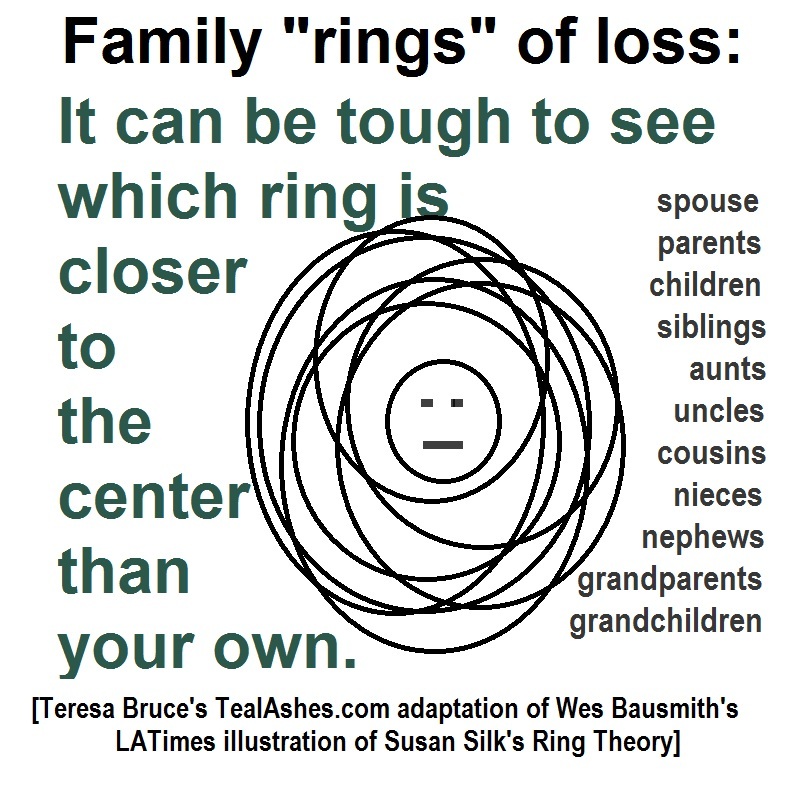 The center of the “Ring of Kvetching” is the person to whom the bereavement, illness, crisis, or other distress belongs — the patient, the dying, the widow(er), the orphaned, the laid-off, the divorced, the ripped-off, etc. People affected in peripheral ways — immediate family, extended family, closest friends, other friends, neighbors, coworkers, etc.–are in the outer rings. If everyone applied such a “comfort IN, dump OUT” filter, it would be much easier to support one another through all kinds of grief, not just due to the death of a loved one but to other losses as well. It can be tough to see which ring is closer to the center than your own. Loss is loss. If you’re in the inner rings, try to remember that those closest to you and your departed loved one are also hurting. Be gentle with each other’s feelings. Try to think before you speak, especially in response to comments that seem hurtful or insensitive to your own loss. If you’re not sure whether the person you’re about to unload on is in a broader, more “distant” ring than you, err on the side of caution, offering only your condolences and willingness to listen.